mmsonline.com DIGITAL EXTRAS MMS OCTOBER 2018 14 mmsonline.com mmsonline.com SPECIAL | Do You Have What It Takes? In anticipation for last month's Top Shops Conference at IMTS, the team put together a special multimedia presentation exploring what it means to earn that Top Shops designation and the steps shops can take to do so. 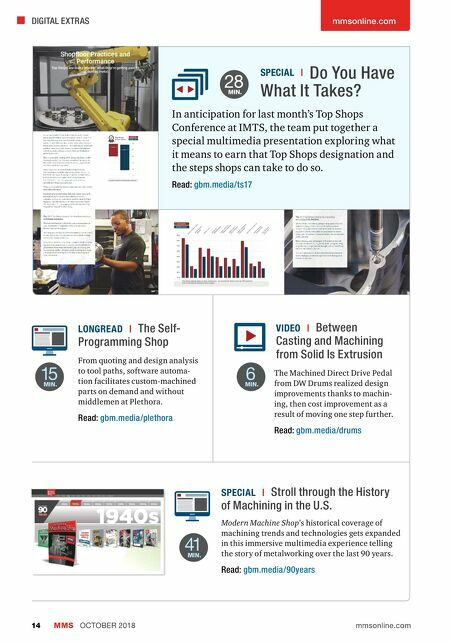 Read: gbm.media/ts17 SPECIAL | Stroll through the History of Machining in the U.S. Modern Machine Shop's historical coverage of machining trends and technologies gets expanded in this immersive multimedia experience telling the story of metalworking over the last 90 years. Read: gbm.media/90years 41 MIN. From quoting and design analysis to tool paths, software automa- tion facilitates custom-machined parts on demand and without middlemen at Plethora. Read: gbm.media/plethora LONGREAD | The Self- Programming Shop 15 MIN. VIDEO | Between Casting and Machining from Solid Is Extrusion The Machined Direct Drive Pedal from DW Drums realized design improvements thanks to machin- ing, then cost improvement as a result of moving one step further. Read: gbm.media/drums 6 MIN. 28 MIN.